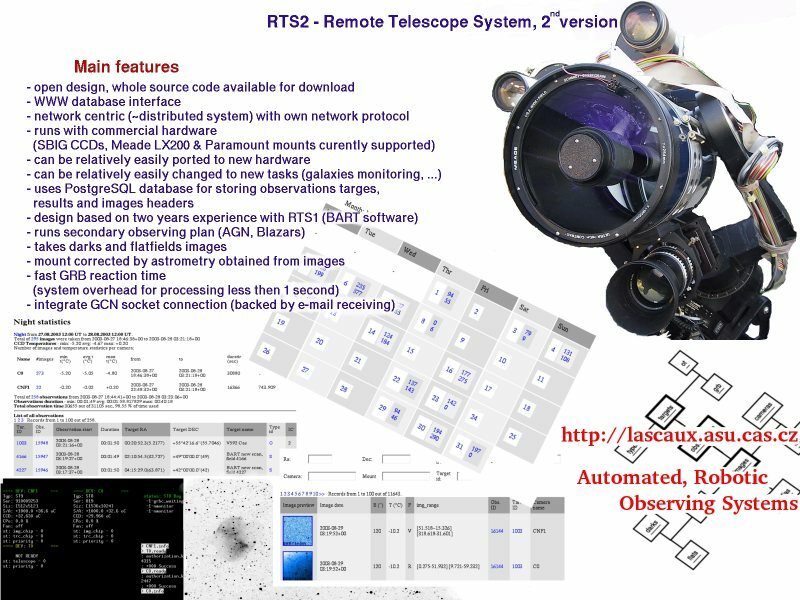 RTS2, or Remote Telescope System, 2nd Version, is an integrated open source package for remote observatory control under the Linux operating system. Its goals is to create a system, which you will put on computer(s) running observatory, and it will keep it running, protecting it from elements, taking images, ensuring that pointing is good, reacting to TOOs, keeping track what was done, sending you data, and helping you to do science. RTS2 is designed to run the observatory in fully autonomous mode, picking targets from a database table, storing image meta data to the database, processing images and storing their WCS coordinates in the database and offering Virtual-Observatory enabled access to them. It is currently running on various telescope setups world-wide. For control of devices from various manufacturers we developed an abstract device layer, enabling control of all possible combinations of mounts, CCDs, photometers, roof and cupola controllers. Download latest version from here. But please be aware, that most of the latest changes are in SVN. You are kindly adviced to clone current sources from Git - follow instructions in INSTALL file. The script will install all required packages, download, compile and install recent RTS2, and setup the system (create database,..) so you can use the system for dummy (simulated) devices. Doxygen documentation is now available in HTML or PDF . Most of "our" (BOOTES, FRAM and BART) data from those publications were obtained with RTS2 at the control. Please post them to petr [at] kubanek [dot] net. For electronic and engineering work the author trust expertises of the ProjectSoft a.s. company. For cloud sensors and small electronics work, the author is using .